#POP by Retail Lab is a piece of heaven – there isn’t any other perfect word to describe it – for shopaholics and fashionistas! They have everything you might want to shop for. In fact, you might get overwhelmed by the amount of goodies and products that they have: clothes, shoes, makeup, travel essentials, food, and more! The Retail Lab is one of the longest running multi-brand stores in the Metro and was first established in 2010 by Claudine Baron and Rosanna Aranez. The goal of the team behind #POP is to bring together homegrown labels in fashion, food, and lifestyle, serving as a venue for young designers and independent labels. 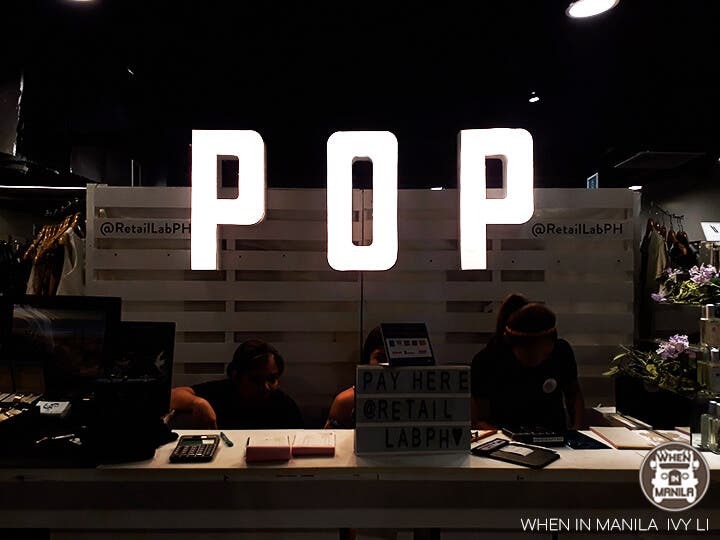 #POP by Retail Lab first opened its doors in Power Plant Mall, Makati last August 2016; but now, it has a 300+sqm space in Glorietta 3, which will be open until February 2018. 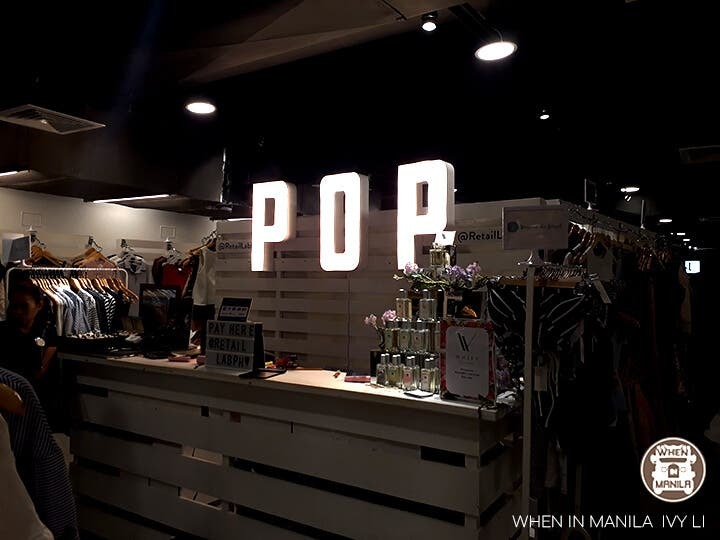 This is their biggest pop store to date, housing over 85 brands, including Beyond the Beach, Annie & Lori, Lily & Jones, Crisp Clothing, Olivia & Fifth, Abby Jocson, Syne Studios, Susto the Label, Beach Republic, Style Box Ph, and Tokyo Beauty Bar. There are also brands in the hub where you can customize products to suit your taste, such as Georgina Sasha (make your own swimsuit, Gira (personalize your Gira Cord), and Stylebox (personalize your own travel essentials). Another one of the many reasons why you should take time to go to POP is because of their gorgeous and colourful interiors. Being in POP is so refreshing to the eyes, you won’t be able to help but fall in love with the place. 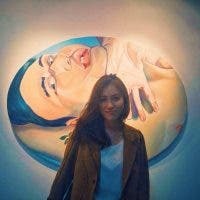 You can take photos at different spots of the store for your Instagram, for example, especially at their colourful photobooth-looking walls. Not only does the place look amazing, but they also have all sorts of items in their hub. I’m not exaggerating when I say they have trendy clothes and accessories to add to your closet. One of the brands to mention is CUBE, which contains cubes of different products – from make up to sunglasses to accessories! It may take forever to shop at POP because of all of the product choices that they have; there are just too many too choose from! Are you more of a foodie than a fashionista? Foodies are also more than welcome to go to POP because of the selections of snacks available. They have a booth entirely for snacks where you can buy healthy barbecue/sour cream cassava chips. You won’t regret snacking on those, even if you’re on a diet–like me hehe. If you’re a shopaholic like me, you know how overwhelming and awesome it is to be in a trendsetter bazaar–all the online stores, trendy outfits, retro eyeglasses, cute iPhone cases, and cute looking swimsuits in one place! Well, POP is just like that! It feels like being in a bazaar full of all of the online shops you usually spend hours scrolling through on Instagram. The only difference is that these are physical stores that you can actually shop and try clothes at. No need for shipping, no need for incorrect sizes, no need to doubt if the product actually looks like the photo (lol)–what’s more exciting than that?! Have you guys heard of POPSOCKETS – those circular things you stick at the back of your phone to grip on? Yup, POP has those, too, and with a whole bunch of cute designs to choose from to boot! I swear it’s going to take you more than an hour to shop here. I took almost 2 hours just going around the place, looking at items and going nuts because they have items I didn’t even know I wanted. Do you have wallets, items, or bags that you want to put a permanent label of your name on? Get personalizing with Gira. They can customize any name you want on their leather items, either in cursive or bold font. You’ll definitely feel unique owning one of these! The items are to die for. The place look aesthetically appealing. And the people at POP are very accommodating and nice. Trust me: one visit to POP just isn’t enough. LOOK: These Swimsuits are Made of Recycled Fishnets!